Three huge releases by some of our greatest ensembles—the Sixteen, the Concerto Vocale, and Les Arts Florissants—are temptingly sampled. 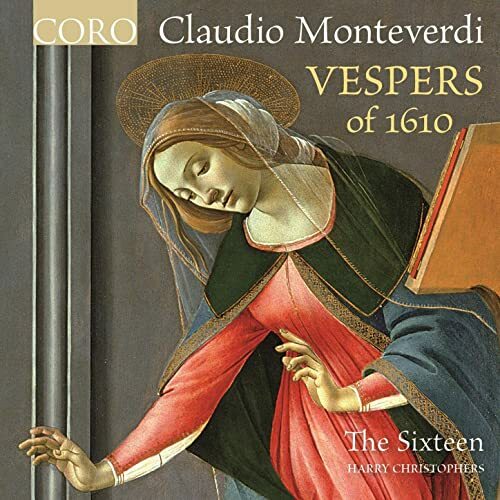 I. Claudio Monteverdi: Vespers of 1610 (The Sixteen/Harry Christophers). Coro CD COR16126. II. 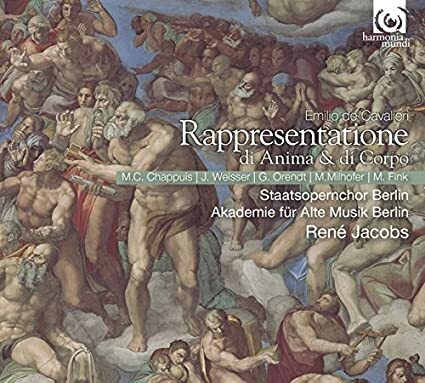 Emilio de Cavalieri: Rappresentatione di Anima et Di Corpo (soloists/Staatsopernchor Berlin/Akademie für Alte Musik Berlin/René Jacobs). Harmonia Mundi CD HMC 902200.01. From The Guardian: Opinions are divided as to whether Emilio de’ Cavalieri should be credited with having composed the earliest operas, and whether Rappresentatione di Anima, et di Corpo, first performed in Rome in 1600, should be regarded as the oldest surviving example of the genre. Anima et di Corpo was certainly intended to be a spectacle, but its form and musical content conform much more to what we would now recognise as a sacred oratorio, than to those of music theatre. The expressive flexibility and power of Monteverdi’s Orfeo, composed just seven years later, are far removed from the rather stock forms of De’ Cavalieri’s score, which can sometimes seem like the incidental music to a series of lavish tableaux. René Jacobs, though, sees no objection to calling the work an opera, insisting that the rather “primitive” recitative and straightforward choral writing were deliberately intended to make the text as clear to the audience as possible. Typically Jacobs make the orchestral realisation of the score sumptuous within its turn-of-the-17th-century constraints; no one could mistake this for anything but a grandly ceremonial piece, and his recording now supersedes the performance from the Utrecht early music festival on Alpha as the one that fans of early opera should seek out. III. Monteverdi Madrigali, Volume 2: Mantova (Les Arts Florissants/Paul Agnew). Les Arts Florissants Edition CD. The idea behind the release of three recordings is to follow Monteverdi’s development from his youth in Cremona (Vol.1), though the establishment of his personal voice in Mantua (Vol.2), and finally to the flowering of the madrigal in his last years in Venice (Vol.3). The recordings themselves come from the Paris performances of our integral Monteverdi's madrigal series which started in 2011, during which we performed all the books of Monteverdi, in order, during a period of three years. They are taken from the concerts themselves ‘live’, given in the Cité de la musique, and equally from short patching sessions either before or after the concert. The aim was to give the listener the sense of the performance, and the text, through the music, being recounted to a public. The choice of works to be included in this recording is an entirely personal one. I was guided by two ideas; firstly that it might be possible to follow Monteverdi’s musical voyage through the compositional medium he most loved, and secondly I was guided simply by the extraordinary beauty of the music. Because our concerts were spaced throughout the seasons of the ensemble, the personnel naturally changed, dependent on the availability of each singer for each period, and so, as the sound may change between one singer and another, I have attempted to maintain the same style and philosophy throughout the series. Monteverdi’s corpus of work forms the foundations of the Baroque, and in performing these extraordinary works I have had to return to the fundamental notions of the music of this epoch. It has been for me, and I hope for everyone involved, a rich education and more than that, a very joyous experience. I pay tribute to the talent, generosity and enthusiasm of everyone who has been involved in this long project, particularly radio France, the CLC, the Théâtre de Caen and the Cité de la musique.